High in flavor and beta carotene. Exceptionally sweet flavor, high beta carotene content, and resistance to a wide range of diseases. This super long, slim carrot grows to 12" and keeps its tenderness and flavor-it's the ultimate snack.. 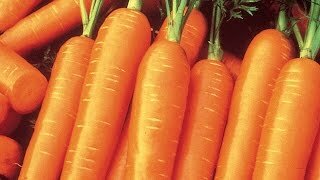 Carrot, Sugarsnax Hybrid is rated 4.4 out of 5 by 9. Rated 3 out of 5 by cassielee from Did I do something wrong? 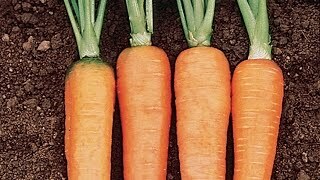 I had a lot of the carrots look like the one in the photo. Not sure what causes that, but I was disappointed. I’m not sure if it’s something I did wrong, as this is the first time I’ve grown carrots, but I followed the instructions. The ones that did not look like that, were also a little disappointing. The description says they’re a sweet tasting carrot and they barely had any flavor. Rated 5 out of 5 by Darius from Best carrots I've ever grown! I grew six types of carrots this year just to see you which ones did the best Danvers, little fingers, Kaleidoscope, Scarlet Nantes, Short ’n Sweet, and Sugarsnax. These grew the best out of all the ones I grew. I will definitely grow these again next year. They grew fast, long, and tasted very sweet and delicious. Rated 5 out of 5 by HappyMonnyTo2 from Grows well in cold climate, good for storage. This will be my third season growing this exceptional carrot. Very sweet and flavorful. Grows really well in our short season (zone 3-4). I just used the last of mine harvested in late September. We rinse only keeping top cap (just tear off long greens) and root end on, kept loosely covered allowing ventilation in a plastic produce bag, they keep from then until March in my refrigerator vegetable drawer. Good canner, lightly steam until tender crisp. I won't ever plant another! Rated 3 out of 5 by ReluctantPrepper from Huge plant, Tiny Carrot Seemed to take a long time to grow, but took off with summer temps. However, the roots (carrots) were only the size of my pinkie after 4 months of growth. I'll try again next year, but I wasn't real impressed with these. Rated 5 out of 5 by FarmerDave from super carrot best carrots I have ever grown. very long, slender and tasty! Rated 5 out of 5 by drmar1 from Delicious carrot Tried these for the first time last year and am planting 2 rows this year. The carrots are delicious - as good or better than the A#1 that we've grown for years. Hardy growers had no trouble with winter frost.